Shopping for a new Kia Soul? Because it’s more useful as a hatchback than a sporty runabout, the Soul Plus fits most Kia buyers better than the turbocharged Soul Exclaim, which doesn’t get critical safety features, at all. The 2019 Soul, Soul Plus, and Soul Exclaim continue to dole out impeccably youthful style, decent economy-car bona fides, and excellent interior space, not to mention a strong warranty. What the Soul still doesn’t offer is automatic emergency braking on any model other than the mid-range, middling-aspiration Soul Plus. 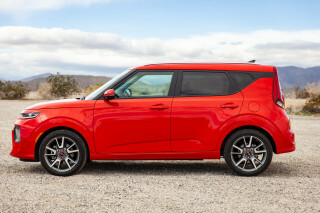 The 2019 Soul isn’t just a pretty face, but it does rely on its style to sell its compact, boxy body. The fresh looks bears a strong resemblance to the first-generation Soul without losing much, if any, of its kicky design details or flair. The tall-roof wagon shape has the instant appeal of this year’s best-selling sports shoe, though inside, it’s a more subdued place, one still rendered in lots of nicely finished shapes and good-quality materials. We’d hard-pass the 1.6-liter inline-4 in the base Soul. Even with an available manual transmission, it’s a sluggish ride. Opt instead for the 161-hp inline-4 in the Soul Plus, and moderate acceleration pairs with a 6-speed automatic that tends to upshift often and early. It’s more gutsy, and 17-inch wheels give it more stick to the ground. We’d recommend the Soul Exclaim and its 201-hp turbo-4 without question, if only Kia would offer the automatic emergency braking found on the Plus. It’s a baffling decision that forces shoppers to choose safety over performance, or vice versa. Packaging is the Soul’s best aspect. The tall roof grants lots of head room, and makes the Soul feel quite spacious, even with the dark interior choices. Four adults will be comfortable for long distances, without a hitch. The space behind the rear seat is larger than in some crossovers, and with the rear seats folded down, the Soul has more than 63 cubic feet of room. The IIHS and the NHTSA both give the Soul top marks, though the IIHS scores it based on the optional braking system only found on the Soul Plus. For 2019 the Kia Soul adds the now-mandatory rearview camera, a standard 5.0-inch touchscreen, and voice control for infotainment. Base models lack some features we’d expect it to have, but Plus and Exclaim models can be fitted with the company’s excellent Uvo infotainment system, with cooled front seats, with leather, and with a sunroof. Our pick: the Soul Plus, priced at about $21,000, an excellent value that just happens to wear a couture look. With the Soul, Kia straps a sport-shoe look on a family-car cabin. Inexpensive? Yes. Cheerful? Just look at it. The 2019 Kia Soul makes for convincing proof that the Target ethos—design done cheap—doesn’t have to make for a cheap-driving or cheap-looking car. Kia blessed the original Soul with functional, fabulous lines. It’s a bit more mature in this second go-around, a Kylie to the original Kim. Kia fits the Soul with a bolt-upright windshield, a canted rear pillar, and a rear end that wouldn’t look out of place on a DVR box or a science-fiction droid. 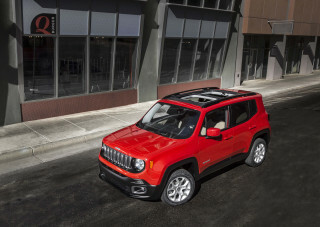 Some models put on too much lipstick in the form of gloss-red and gloss-black trim, but the body-color bumpers of more costly models unify the style statement. It’s way too rare for $20,000 hatchbacks to outclass cars that cost twice as much, but the Soul does just that. The Soul’s cabin wears some premium bits among the economy-car shapes and textures. The Soul’s steering wheel’s amiably chunky, the gauges have a slightly racy look, and the dash and door panels wear soft-touch trim from elbow height on up. Speakers sprout from the top of the dash, and the center stack of controls leans in toward the driver in a subtle, personal touch. You’ll come for the zippy power of the Kia Soul turbo, but leave scratching your head at its curious equipment omissions. There’s one Kia Soul powertrain we’re eager to drive a second time, but buyers need to know it comes with an asterisk. Base Kia Souls for 2019 have the same 1.6-liter inline-4 as last year, with 130 horsepower on tap, and 118 pound-feet of torque. 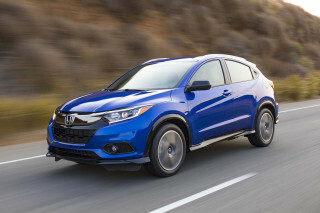 With either a 6-speed manual or 6-speed automatic, it shows its colors quickly. The Soul’s not particularly light, at about 3,000 pounds, and the underpowered base engine gets flustered easily. It’s not impressive, and unless price matters more than anything else here, we’d recommend you move on. That means spending more money on either a bigger 4-cylinder or on a turbo-4, which seem to have undergone a messy separation. The less impressive, naturally aspirated 2.0-liter inline-4 comes in the Soul Plus. It makes a healthy 161 hp and 150 lb-ft of torque. It comes only with a 6-speed automatic. It can be ordered with automatic emergency braking, a proven lifesaver that should be available, at least, on all models. We don’t have any qualms with the midline engine’s desire to upshift quickly, or its middling power; we do take issue with the safety gear that’s only available in this trim level. Order the turbocharged 1.6-liter inline-4 and its 7-speed dual-clutch automatic, and you’ll forgo that safety equipment for the drivetrain we like best. The Soul turbo (or ! in Kia-speak, or Exclaim if we must) has real right-foot urgency and in stoplight launches. 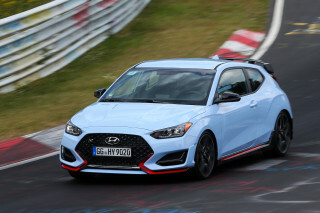 It also doles out a fair amount of torque steering, which can be negated by a flick of a switch into Sport mode, which adds weight to the steering without adding much more information. Kia redesigned the Soul in 2014 and when it did, it updated the suspension with more travel and better shocks. For a tall wagon with a short wheelbase, the Soul does its best to mitigate what could be a harsh ride on broken pavement. It’s no VW Golf, but the ride quality is better than it might be, and proof that a kicky shape with lots of space doesn’t have to kill all the economy-car joy. All small cars should have the charmingly efficient space of the 2019 Kia Soul. The 2019 Kia Soul has a small-car footprint, but lots of overhead room gives the impression of a larger car. 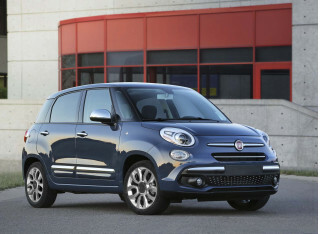 It’s a strong package that’s great for four adults of most body types and sizes, and cargo space is abundant. The Soul specs out at 163.0 inches long, with a 101.2-inch wheelbase. It’s divided fairly between front and rear seat passengers, with a sizable cargo hold even before the rear seats fold down. In front, passengers get excellent leg and head room. The Soul’s seats have high bottom cushions and the instrument panel sits low. Some tall drivers may feel the pinch of the optional sunroof, and the seats themselves could use more support at the legs, but they’re firm enough for long-distance comfort. Three passengers won’t be happy in the back Soul seat, but two will be just fine, even if they’re very tall. The Soul even has an armrest between the back outboard seats so parents will get a moment’s peace when they lower it. Or, that’s the idea, anyway. Behind the rear seat the Soul has 24.2 cubic feet of space. Behind the front seats, some 61.3 cubic feet of room makes the Soul a truly versatile vehicle for all kinds of errands. In our first road test of the turbocharged Kia Soul we found lots of engine droning distracted from its otherwise pleasant fit and finish. We wish Kia would spread automatic emergency braking across the Soul board. Kia makes some frustrating packaging decisions with safety features in the 2019 Soul, but the numbers don’t lie. The IIHS calls the Soul a “Good” performer in almost every critical crash test and grants it Top Safety Pick status. The NHTSA agrees and says the Soul is worth five stars, albeit with a four-star score in some subtests. Kia offers automatic emergency braking, but only as an option on the Soul Plus. Our score might rise to an 8 out of 10 here, once Kia spreads the AEB love across the lineup. A rearview camera is standard now, as required by law, but it means the base touchscreen display now sizes up at 5.0 inches. Blind-spot monitors are an option on Plus and Exclaim models. The 2019 Kia Soul still misses out on some key features, but its warranty gets the nod. 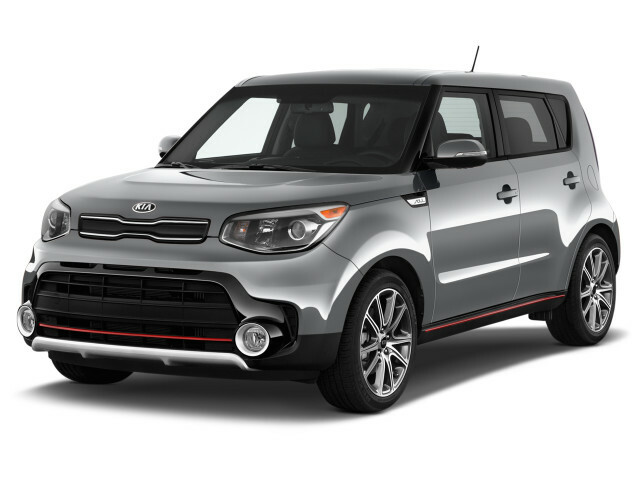 Priced from about $17,500 to $23,000, the 2019 Kia Soul marches buyers up a relatively short, easy to climb price ladder. But Kia insists on making some features scarce and that offsets the appeal of its excellent warranty. The 2019 Soul, Soul Plus, and Soul Exclaim all come with a fair amount of standard equipment. It misses out on a free point for the omission of cruise control and a center armrest in base trim, but the Soul does have standard air conditioning, power features, Bluetooth, satellite radio, and a split-folding rear seat. This year, the mandatory rearview camera means a 5.0-inch touchscreen now is standard, too. A convenience package adds the useful Uvo infotainment system, which runs on Android software and uses smartphone data to power its connected apps. On the Soul Plus, Kia adds Android Auto and Apple CarPlay compatibility and a larger 7.0-inch or 8.0-inch touchscreen, body-color trim, heated side mirrors, fog lights, and 17-inch wheels. On the option sheet, the Plus can be fitted with cooled front seats, a sunroof, heated front and rear seats, 18-inch wheels, and forward-collision warnings with automatic emergency braking. The latter features only come on the Plus, only for more money. It’s a maddening choice when other car companies have made the equipment standard. The Soul Exclaim adds gloss trim inside and out, leather upholstery, and keyless ignition. It doesn’t offer cooled seats or automatic emergency braking, yet it costs more. Color us...? Or is it…! We’ll leave those decisions to the copy proofers. 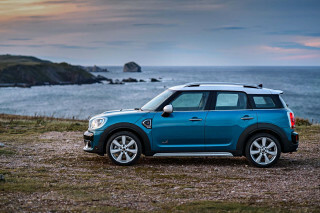 Great in raw numbers, the Kia Soul gets slightly lower fuel economy than some rivals. The Kia Soul wants to deliver great fuel economy, but lands instead at very good. The engines are willing; the tall hatchback body, less forgiving. The EPA pegs the current Kia Soul at 25 mpg city, 30 highway, 27 combined in base trim, when configured with a 6-speed automatic. Those numbers fall to 24/30/27 mpg when it carries the 6-speed manual. The Soul Plus gets a 2.0-liter inline-4, and with the automatic, it’s pegged at 25/30/27 mpg. The top 1.6-liter turbo-4 Soul sports a 7-speed dual-clutch automatic for the best fuel-economy ratings in the lineup (other than the electric-only Soul EV, which we cover in another review). The turbo Soul’s rated at 26/31/28 mpg. Compare those figures to something like the Honda Civic and its combined mileage in the 30-mpg range, and it’s clear the Soul’s shape exacts a price.